HONG KONG (AFP) ― The new year has revived old problems for Hong Kong as a murky smog blankets the usually glittering skyline, fueling complaints from locals and visitors alike, and raising pressure on the government to act. Tourists expecting to take holiday snaps from the famous Victoria Harbor waterfront have found it hard to distinguish Hong Kong’s trademark skyscrapers and mountainous backdrop, while residents are becoming increasingly worried for their own health. “It’s scary,” said Julie Crossley, a 39-year-old sales manager from South Africa, visiting the city for the first time with her young daughter. For German tourist Harald Gummlich, 60, the pea souper was not what he was expecting. “We’re still waiting for blue skies,” he said. The government’s new, more stringent, pollution index has revealed the frightening extent of the problem, with high or very high levels of pollution recorded almost every day since it was implemented at the end of 2013. The Air Quality Health Index came into effect on Dec. 30 and links pollutants to health risks. Pollution levels have reached the index’s top “serious” category on four days so far, under which people are advised not to stay outdoors for a prolonged period. Hundreds of residents have taken to Twitter, Facebook and newspaper websites to voice their concern. “Yesterday’s pollution was truly shocking ― made my eyes sting,” Hong Kong based @Alieeeson tweeted Thursday. Local campaign groups are hoping the results of the new AQHI system will finally galvanize the government into action. 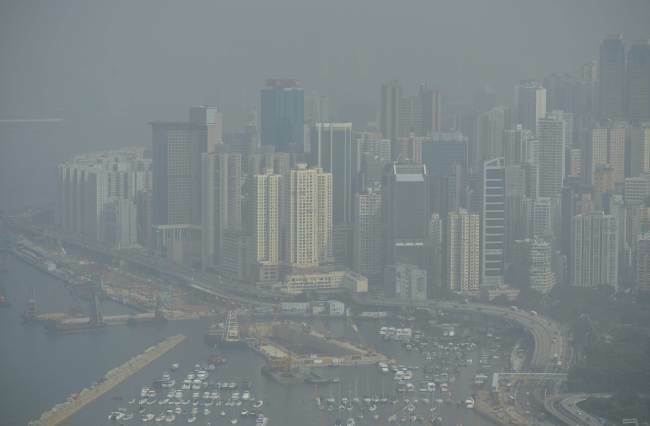 “It certainly should kick the government into doing something,” Clean Air Network chief executive officer Kwong Sum-yin told AFP. The index monitors the concentration levels of multiple pollutants and measures their health effects through tracking hospital admissions for respiratory and cardiovascular diseases. Its introduction comes after city leader Leung Chun-ying pledged to make pollution one of his top priorities during his five-year term, with an official report saying it was the “greatest daily health risk” to the city’s residents. Government proposals to reduce emissions include a plan to replace more than 80,000 older commercial diesel vehicles between 2014 and 2019, and a requirement for container ships berthing in the city to use cleaner fuels. But campaigners are frustrated at what they see as a lack of urgency in implementing the moves. “We are not very happy with the timeline,” Kwong Sum-yin said. A government scheme to replace catalytic converters on 20,000 vehicles, mostly taxis, kicked off in October last year to lower nitrogen dioxide. The Clean Air Network is pushing for comprehensive low-emission zones on the roads and in Hong Kong waters. Friends of the Earth’s Chau suggested the government should also consider limiting the number of cars on the road when air pollution reaches a certain level.